10 Best Fingerprint Door Locks Reviews - Biometric Locks in 2019! Biometric fingerprint door locks have been around for over 30 years, ever since fingerprint recognition software was reliable enough to provide accurate and constant recognition of scanned patterns. At first, these scanners were large and chunky and were used for military and high-security companies. Those locks were used instead of common locks for storage units. 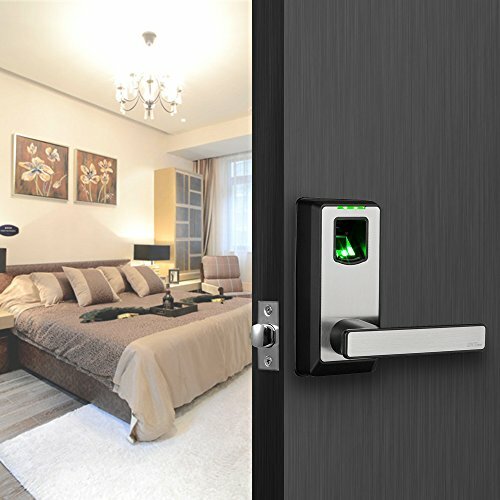 Today, due to the advancement of recognition software and hardware, anyone and everyone can have a biometric fingerprint door lock and door access control system installed. There are many options to choose from, but we will concentrate on two model types, mortise and stand alone. Like in biometric gun safe, fingerprint scanners are considered today as simple machines to make; they employ a fingerprint scanning glass that you place your finger over to initially record your fingerprint into the database. The software then scans all fingerprints and compares them to the database of fingerprints in store, if the scan matches to a level of integrity accepted by the software, then the door mechanism is activated. A fingerprint scan is a personal key, and when used will secure access to specific users. 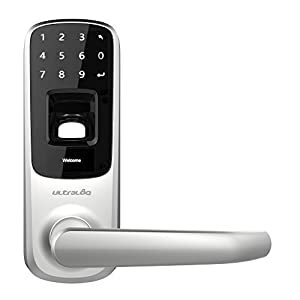 However, the scanner is only as good as the locking mechanism, so you must make sure you buy a system that fits into a mortise lock in place or comes as a complete unit. Now, once you buy a complete unit, you have to look at the lock and not just the scanner. Don’t let the fancy buttons, screen and lights take your eyes off the real issue, the lock. Make sure that the lock is up to standard, made of durable materials and that it will secure your location properly. Also, check to see how the lock is powered, is it by battery or connection to the main power supply. Also, check if the system can be accessed by a security system network, or by wifi, Bluetooth or any other option that can make the system vulnerable, but at the same time more convenient. Some models come with fingerprint scanning, keypad input, and key lock. Others will include access via a mobile device, a remote control, a smartphone, some keycard and other biometrics. Hybrids can deploy all systems together or only one to activate the system. 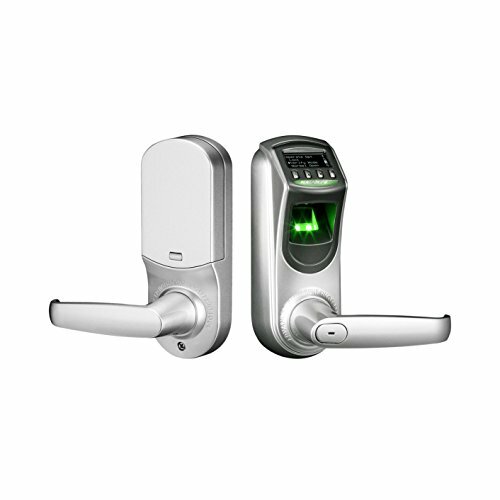 This means that if you have a triple hybrid system, it will require three levels of activation to open the lock. Other triple hybrids only require one of three to open the lock. So, make sure you understand the levels of confidence and security you are buying. Remember we talked about the lock, well this is important. Is the locking mechanism a mortise lock? in this case, the lock is inserted into a door pocket; this means that the unit fits into a mortise lock that is in place. Or is it a standalone? A stand-alone means its attached to a door such as a unit attached to a glass door and comes with the actual locking mechanism built in. Also, how secure is the locking mechanism, is it only a lock bolt, or is there a deadbolt? When buying a biometric fingerprint lock, check for the brand and manufacturer. The brand name should be known; it doesn’t need to be a leading name since not all leading brands produce the best fingerprint locks. Check up online reviews and look for the reliability of the design. How many memory allocations it has, which will let you scan in more than one fingerprint. The final piece in the puzzle designs, certainly, you should buy one that looks good and fits in with your environment. Finally, check the price for your budget considerations. You will find that these locks are not as expensive as you think and are a great security device where you want extra privacy. Software Capability; how versatile and reliable is the software? Hardware Reliability; how reliable and sturdy is the hardware? Lock Mechanism; how strong and smooth is the locking mechanism? Our review is based on these four categories, which will make life easier for all of us. With no further ado, let’s take a look at the best biometric fingerprint locks you can buy online. The TL100 is a fingerprint lock with the voice-guided feature is an extremely versatile lock form a reputable company. What is excellent is its versatility, providing you with four activation options. It also comes with the lock mechanism, which means you don’t need a mortise lock in place. The voice guidance system helps you in the dark, children, or for people with poor eyesight. The software is highly versatile and can hold up to 100 fingerprints in memory as well as 100 keycard ids. It has an advanced fingerprint identification algorithm that provides fewer fails than most standard units. You have to register one administrator otherwise you cannot add users. The unit operates from >=32oF and includes a USB data upload port, illuminated keypad for night or poor light conditions. It also has an external power source link, so you can use that as back up when the eight alkaline AA batteries lose power. The unit comes with its own Anti-theft mortise with one latch and two security deadbolts that incorporates an idle handle design to prevent forcible entry. The lock is made of sturdy stainless steel and is extremely reliable. Streamlined for indoor and outdoor use. This is an advanced system that gives you ample versatility. With 100 user configurations, the mechanical override key that helps when the system is down (rarely) and the mortise locking mechanism that comes with this unit, make it a perfect solution for multiple sites. 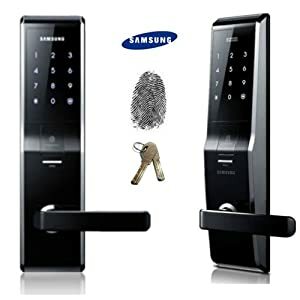 In other words, if you intend to use more than one fingerprint lock in your home or business, buy more than one of this unit to keep familiarity in place. Ultraloq UL3 smart lever lock is a venture capital product that was developed to be keyless. This unit is a hybrid unit that has 3 options, a fingerprint, keycode and public key to unlock the door. What is unique is the Anti-peep Password system which allows you to input any number of digits in random order, so long as the correct password (keycode) is inserted within that long number. The unit uses 3 AA batteries that give you up to 8,000 activations. The touchscreen uses an OLED that is supported by software that walks you through the process. The lock is a solid one-piece Zinc Alloy body that has IP65. 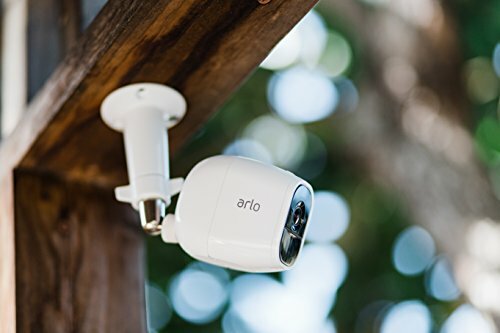 This makes it completely waterproof and dustproof, so you can use it outdoors as well as indoors. The lock was designed to be mechanical keyless so that you don’t need to carry anything or remember a card. You just use a fingerprint or a code or use the public key code to activate. This unit comes with a single latch, and you can buy an optional deadbolt cover plate required for replacing your existing deadbolt. The design is extremely simple, and as such makes operating it easy and efficient. A very smart simple lock for indoors, I personally prefer one that has a mechanical key override, just in case. Having said this, if you want a truly secure system where no lock picking can override the system, then this is the unit you want to get. This is a classic indoor or small business lock for apartments that are rented out. The system is operated by smartphone and has tracking and operational control from a remote place. The locking mechanism is operated by three functions, fingerprint, smartphone keycode, and Bluetooth. A downloadable app that enables you to input fingerprints, keycodes, and Bluetooth recognition. You can provide access codes that are easily removed to visitors, so this is a perfect Airbnb option and short let the system to anyone with a smartphone. The fingerprint option is great for storing up to 100 constant users, such as family members and friends. The system can withstand temperatures >=23℉ and comes with a standard optical fingerprint scanner. The body is made of sturdy stainless steel which comes with a simple latch bolt in place. Sturdy, simple look. No keypad, no keyhole. Just a lock with a scanner. You either connect by using your finger or using a smartphone. This is a really simple solution for a commercial short let location that doesn’t require fingerprints from random visitors but can also be used by frequent visitors using the fingerprint console. It also has a 24/7 activity log, so you can track the locks activation and by whom. 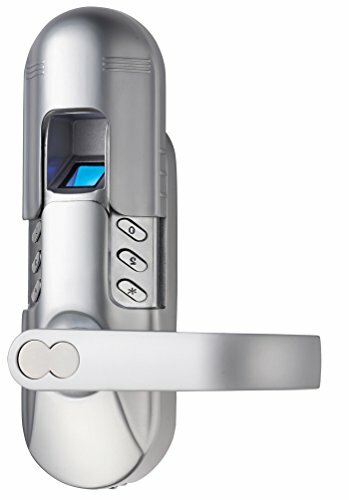 This is ZKTeco smart door lock, which comes with 3 ways to operate, fingerprints, passwords, and a mechanical key. The software can store up to 500 fingerprints, and 100 passwords. It comes with an activity log to track the locks usage. The system is powered by 4 × AA Alkaline Battery and has a 9V power inlet when the batteries are low. It also has a USB disc slot for communication link up. The system will operate within 32 ºF to 122 ºF. The OLED module provides an easy to read display, which is extremely helpful. The lock is zinc-alloy cased and comes with 2 mechanical keys. The lock can be placed in passage mode, which means it will be unlocked until returned to normal operation and is adaptable to any mortise lock body in place. This is a compact design aimed for efficiency. 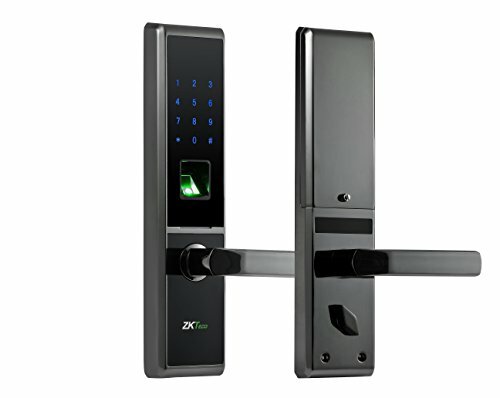 An excellent solution for any business, where you need constant access during working hours, but secured access when not in use or for rooms with infrequent usage or high-security issues. Samsung is a name synonymous with excellence. So are their biometric fingerprint locks. There is not much to add when the name is Samsung, so let’s go straight into the details. 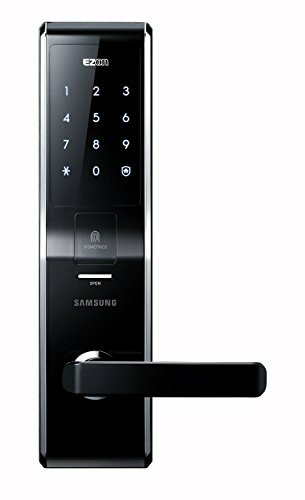 The Samsung software package that comes with this lock includes a 100 fingerprint database, as well as 100 passcodes per user. This unit provides a double activation security measure, where you need to pass the fingerprint scan and the passcode as well. So, it’s a double security feature that makes this particular model very hard to overcome. What is nifty is a sound linked digit code, this means you can set sounds to different digits so if you cannot see the keyboard you can at least hear it. As with all Samsung products, they go through rigorous testing and checking. These locks are all electrical shock proof, circuit instability proof. They also added extra heat prevention where the mechanism can withstand the heat of over 60⁰C, in which case the lock will open automatically. Now in our opinion, this is a problem, since thieves can use a small blowtorch and the door will be bypassed. What we did like is that is has a manual override when the system becomes unstable or stops. The locking mechanism comes with a night/day lock on the inside, which is a great future since this secures the room when it is occupied. Another great feature is when the power runs out, there is an inlet that lets you open the door with a 9v battery. The system is used with a standard mortise lock, so you can insert this over any mortise unit you have in place. Very smart, smooth looking design, which is what you would expect from Samsung. The Ardwolf M400 Security door lock system is a great home system for sophisticated users that want a bit more protection than a standard lock and key unit. The system allows you to save up to 100 fingerprints and has only one issue that it doesn’t allow the use of the digits 0 and 9, which can be an issue for some users. The Ardwolf uses an Optical Sensor and has a touchscreen keypad. The touchscreen is made of durable material that is easy to wipe against remaining fingerprint signs. The fingerprint scanner overlooks residues from previous prints. The system operates from 4 AA Alkaline of 1.5V and can operate up to 5,000 times before replacement is required. It has a versatile temperature range of -15oC to around 55oC. The processor is an ST chip, which means it gives you fast and efficient processing power. The overall look and feel are strong and reliable. This indoor unit is extremely suitable for most homes and is a great option for securing those rooms with more expensive items. This is another Samsung digital door lock that comes with proven and reliable features. As a mortise lock unit, it comes with its own mortise locking mechanism, so you will need to take out the old mortise locks and replace them with this one. 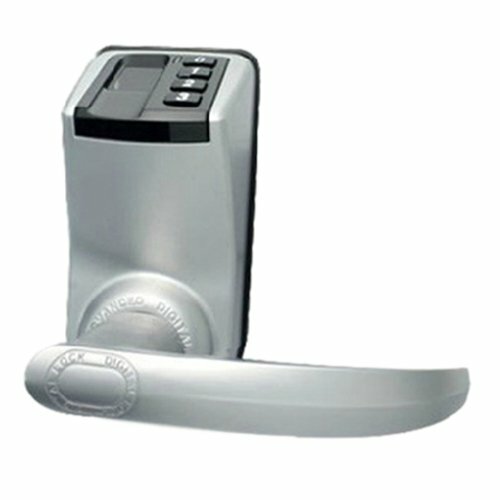 The system supports RFID, keypad, biometric (fingerprint), or Bluetooth. The software provides you with any 4 to 12-digit number combination, and you can save up to 10 such passcodes. It is also RF ID ISO 14443A compliant, and you can add up to 20 Samsung key tags or cards. You can enter up to 100 fingerprints into the memory bank. The system requires two methods to operate the lock, a fingerprint and passcode combination. This is a push-pull mechanism, dual way, which means you push from the outside and pull from the inside, which does not conform to fire regulations, and in my opinion poses a problem. There is no handle, so you cannot force the mortise lock to open without the proper code and authentication. A very futuristic sleek design aimed. An expensive item, but it is Samsung, and you do get quality. My only issue is that it poses a fire hazard threat since it pulls from the inside. Adel is a Chinese company based in Shenzhen that produces high-quality locks. Their systems are used all over China and are sold worldwide. The system can save up to 120 fingerprints and passcodes, and the operating mechanism requires the use of both to operate the lock. The system uses a 30 Megapixel CMOS Color Sensor that can scan up to 500 DPI. The power required is supplied by 4 AA alkaline batteries and has a 6V or 9V external power supply. 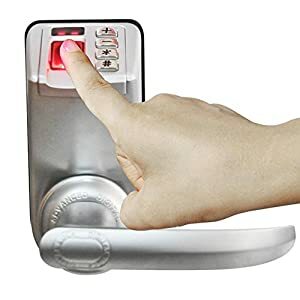 This unit connects to a mortise lock and will operate when a fingerprint and a passcode have been entered. It comes with a mechanical key when the system needs to be opened in an emergency or to override a failed system. This means that you can buy this one safely and be ensured there is someone to talk to in case of any issues. All in all, exceptional value for money on the lower range of the biometric security scale. This is another Adel lock, Adel is a Chinese company based in Shenzhen that produces high-quality locks. Their systems are used all over China and are sold worldwide. 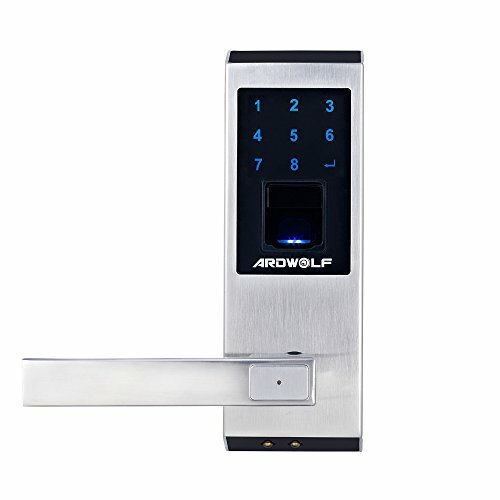 The system can save up to 99 fingerprints and one group passcode, and the operating mechanism requires the use of both to operate the lock. This model connects to a mortise lock and will operate when a fingerprint and a passcode have been entered. This unit is a simpler version of the Adel 3398; it comes from a reputable Chinese firm. This means that you can buy this one safely and be ensured there is someone to talk to in case of any issues. If its simplicity you want, you don’t get much simpler than this model. This is great for apartment buildings. The Digi biometric fingerprint lock is a great outdoor unit, it comes with a small casing and has a weatherproof cover to secure the scanning surface. The lock can be made to be a left door or right door handle. This unit is suitable for a 3 to 5.5 cm thick door, it has a single handle and fits into any mortise locking mechanism. Reliable scanning and reading, don’t have errors unless your finger is dirty. The database can store up to 75 fingerprints and 78 passcodes. The scanner is optical and can handle up to 560dpi, and the system is powered by 4 x 1.5v AA Alkaline Batteries. It can withstand 10%-97% humidity and works in a temperature range of -20C to 60C for the Fingerprint console, and from -30C to 70C for the keypad. The lock is made of zinc alloy and stainless steel and is ANSI Grade2, CE certified. It fits into a mortise locking mechanism in place that is 3 to 5.5 cm thick. The design is compact and simple since beauty is in the eyes of the beholder we will not decide for you what is nice or not. This model provides ample fingerprints for a versatile model, a keypad for when you cannot use the fingerprint and an override key in case of emergencies. Generally, a good sturdy model that fits into your mortise lock, making this an excellent, value for money locking solution for your home or business. Biometric fingerprint locks are abundant on the market. There are pricey high brand models with multiple functions and are incorporated into the IoT. Other are simple locks that provide a biometric solution to a mechanical key. The further development of IoT will introduce over the next few years comprehensive locking systems that link up to your smartphone and provide real-time metrics and control for ever day use. These systems are already in place in bespoke security systems but are leaking into the market as IoT grows. The models we provided are low to middle range units, they are easy to install, and maintain and provide extra security to an adequate mechanical system. Just remember, the use of a biometric lock does rely on electricity, so if you do install a stand-alone unit with battery packs, make sure you check their power and replace batteries. Another issue to remember, a biometric lock is not impregnable, and while it sounds so nifty and scientific, is in fact it’s just another method for operating a lock. Which means, all you are doing is replacing your key, if your lock is not strong the biometric unit will not make it any stronger.